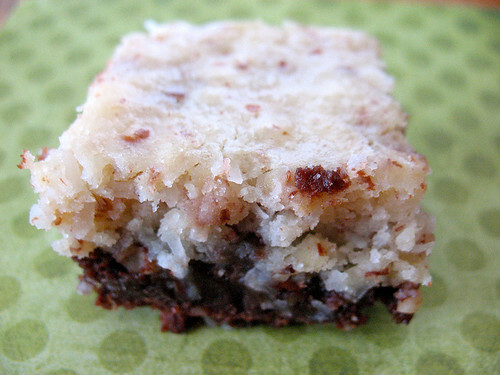 Dense chocolate topped with a coconut almond macaroon, these are incredibly good. If you like Almond Joy chocolate bars, they have many of the same flavours! They also freeze really well and make a nice gift for someone special. I'm not sure where this recipe came from, it was given to me by a friend. Melt chocolate and butter together in a saucepan over low heat, stirring. Set aside and allow it to cool. Whisk in the sugar and then the eggs one at a time. Stir in the vanilla. Fold in flour and almond. Spread into a greased, foil or parchment lined 9x13 inch cake pan. In a bowl with an electric mixer, beat together the cream cheese, sugar, eggs, and flour until smooth. Stir in almonds and coconut. Gently spread over the brownie batter in the cake pan. Bake 35-40 min at 350 F, or until a toothpick in center comes out almost clean. Cool in the pan. For a finishing touch, drizzle the top with melted chocolate and top each square with a sliced almond. Feeling decadent? Try a chocolate coated almond on top!